from ash trays to cutters to lighters and more. 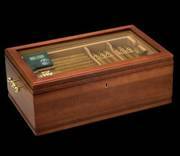 We have many different styles of humidors to choose from. Diamond Crown, Craftsmen Bench, and more are on display. Small to large sizes, travel to cabinet styles. We carry a full line of Colibri, Prometheus, and Xicar butane lighters and Zippo liquid fuel lighters. Whatever style of lighter you like, you should be able to find it at Red Lion Smoke Shop. Red Lion Smoke Shop carries an extensive line of cigar cutters; straight cut, V cut, hole punch, or nail point. Red Lion Smoke Shop carries many fine leather cigar cases. 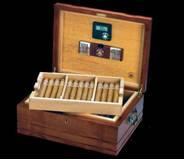 Light or dark colored, 2, 3, or 4 sleeves, from Robusto to Churchill sized.